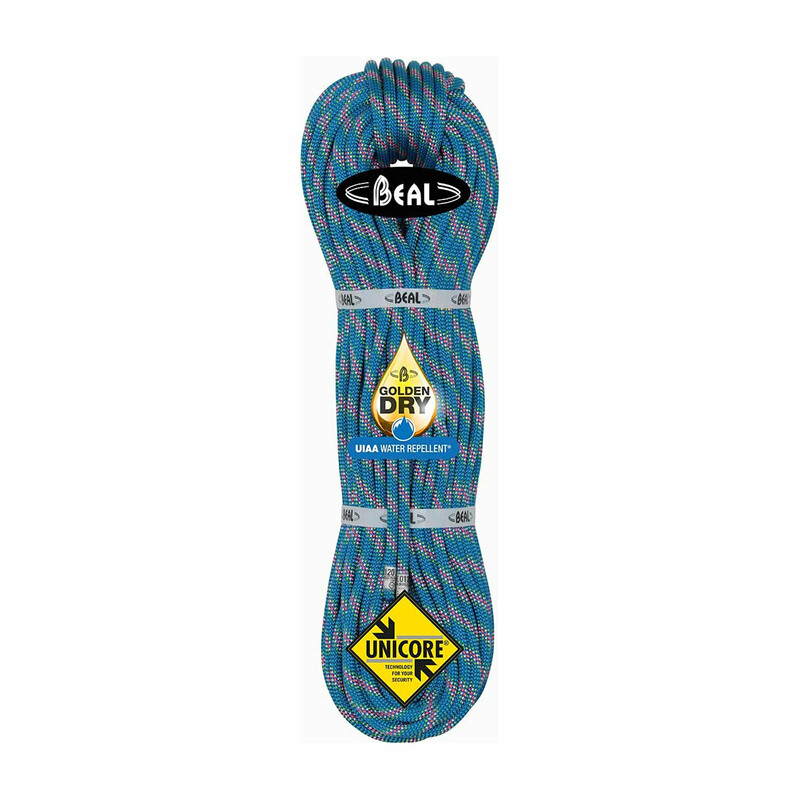 The Beal Cobra ll 8.6mm climbing rope is considered one of the best multi-use double ropes on the market, thanks to its excellent handling, low impact force and incredibly light weight. The Beal Cobra ll excels at anything from long multi-pitches, ice and mountaineering routes to afternoons at the crag, thanks to the easy-to-handle 8.6mm diameter and Beal’s Golden Dry treatment, which means both the sheath and core are protected from dirt, ice and water. The Cobra ll also features an extra thick sheath, which is ideal for use across all types of rock, while Beal’s unique Unicore treatment bonds the sheath to the core for extra safety, even if the sheath gets cut. Beal’s Golden Dry Treatment means that both the sheath and the core of the rope have been treated to resist dirt, ice and water. This makes the Beal Cobra ll 8.6mm ideal for ice climbing and mountaineering routes because it won’t freeze up or absorb a lot of water. Golden Dry Treatment also increases the longevity of your rope and improves the handling. Win, win. The Beal Cobra ll 8.6mm features Beal’s unique Unicore Technology bonds the sheath and the core of the rope together, which drastically reduces sheath slippage and makes your rope much safer to use. The Unicore Treatment means that you can still safely rappel or abseil to safety if the sheath of your rope gets cut, as it won’t slip and bunch up and become impossible to pass.